Machine wash cold with like colors. Dry on low heat only. 100% COTTON SHELL with SWEATSHIRT INTERIOR - This robe features a 100% cotton shell exterior with a soft polyester interior just like your favorite sweater. TWO LARGE POCKETS are available to help hold your cell phone or remote during the big game. 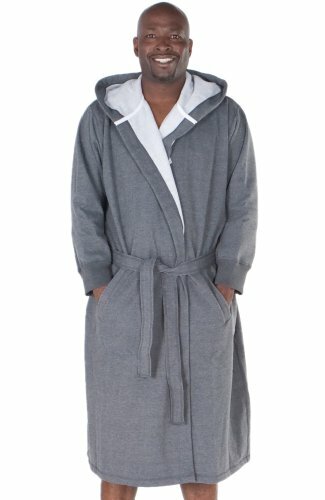 WARM HOOD - The most loved feature on this classic men's bathrobe is the large hood. This water absorbent detail will keep your ears, neck, and head warm even on the coldest winter night. SAVE ON YOUR ELECTRIC BILL by turning the heat a little lower and wrapping up in this sweatshirt like hooded house coat. You can stay in your underwear all day and still be warm. EASY TO WASH - Even though this is a luxury sweatshirt style robe, it is not difficult to wash. This robe is machine washable and can be dried in the dryer on low. You can even use this robe as a smoking jacket or to cover up after a workout at the gym and know that you'll be able to wash any residual smell right out, 100 percent of the time. GREAT AS A GIFT - A bathrobe is one of those warm familiar products that you didn't know you needed until you finally got one - which is why it makes the perfect present for your dad, husband, son, or friend. The sweatshirt style design of this robe is perfect for any athlete or sports loving man. If you are looking for a great gift for Christmas, a birthday, or other special occasions - look no further.